March 12, 2014 February 10, 2016 ~ Sara W.
As mentioned in my previous post, I am working on improving myself as a blogger. Part of that involves building my content on my own blog. This is why I plan to sprinkle in some of my posts here that were originally shared on Over the Big Moon. This particular post was from September of last year. Here it is, in case you missed it! not match my values. It’s not that I don’t give those three aspects of my life attention, but certainly not in a manner that would reflect it as my top three core values. I’ll be the first to admit, I get sucked in to my smartphone, social media, and pure laziness. I walked out of my therapist’s office that day with a goal to have my values and actions line up more appropriately. Sadly, I quickly fell back in to old habits. Flash forward to a few weeks ago. A friend and I were discussing the pitfalls of social media and the smartphone. We confessed to each other that we wasted far too much time on our devices and didn’t tend to our home and family like we ought to be. We both decided to create goals that we could easily track. We used an app (ironic, right?) called Habit Goal Monitor. You can get it for free. We plugged in our goals and revitalized our efforts to have our actions and values align. Then this past weekend, as my goals were looking bleak, I saw this piece of paper hanging on a wall in my church building that read: VALUES – You do what you value. 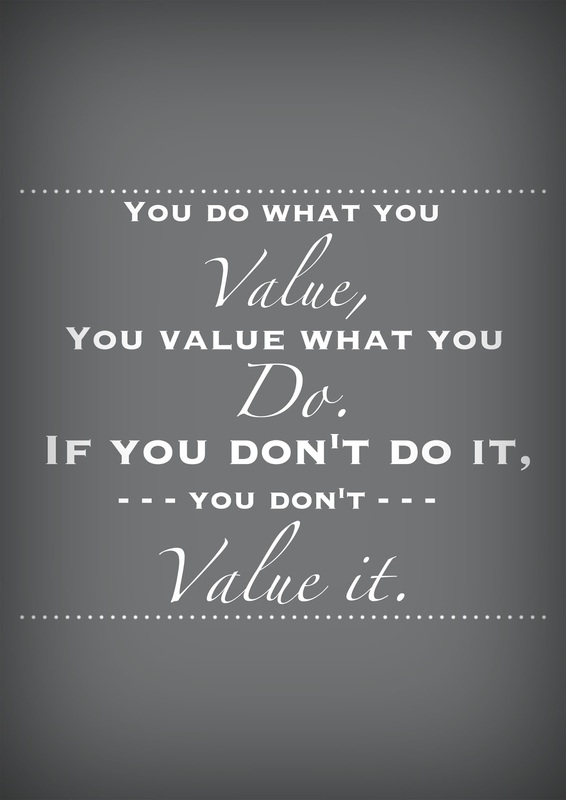 You value what you do. If you don’t do it, you don’t value it. Hello, Not-So-Subtle Reminder, thank you for joining me. I could easily have felt defeated at this point. It felt like a reprimand. I decided to look at it as a little nudge to begin again. Pick up where I am and keep going. In my effort to honor the things that I value, I am trying to have personal and family scripture study daily, I am looking up at my children more even when they are doing the mundane, and I am putting the phone down when there is an opportunity for personal communication with loved ones. I had a moment this past Thursday where my values and actions were in sync. I decided to act out the scriptures that I was reading to my kids before school. They found it hysterical that their Mom was up on a chair trying to be as a Prophet speaking from a tower. The result was a positive experience with my girls that they brought up throughout the day and even shared with friends. I don’t plan to act out the scriptures every morning, but seeing the impact that had on my children motivates me to create more opportunities like that in their lives. I’ll stumble, of course. But I imagine what kind of woman I could be if my values and actions were perfect reflections of one another. If it feels as uplifting as it did that Thursday morning, then I will begin and begin again.